It's summer, and Rome beaches are calling. Did you know you can easily reach the beach from Rome, in less than an hour? Find out how! 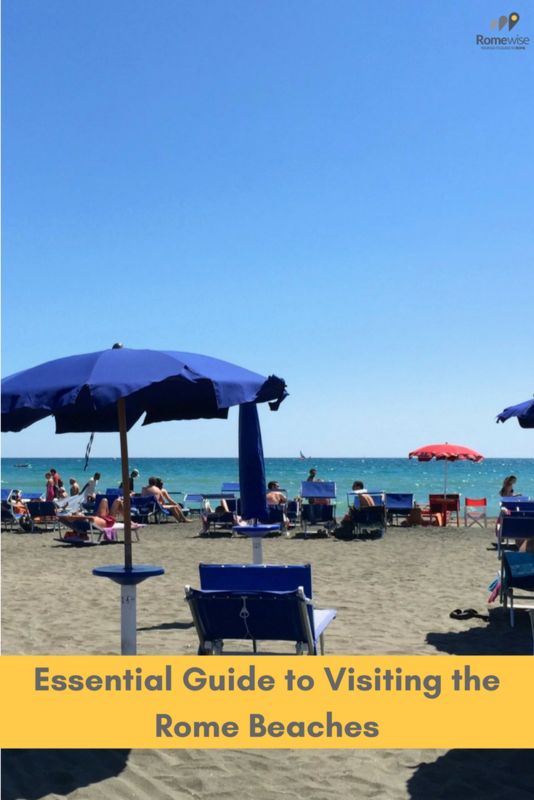 Getting to Ostia beach from Rome is easy and inexpensive on the train. In less than an hour, you could be here! Typically, visitors don't come to Rome to go to the beach. But when summer heats up, I find people, especially families with young children, start asking about how to get to the beach from Rome. Rome is not far from the coast, so you have plenty of options for easily visiting a beach from here. At the bottom of the page, you'll find a map with all the Rome beaches listed here, plus any other relevant places in each spot, such as a mid-way station, a restaurant I like, or other things to do there. You can almost always find part of a given beach that is spiaggia libera, or "free beach", but sometimes this can be a limited space. You should know that in Italy (and in many other countries in Europe), it's fairly common to pay to use the beach. When I first started visiting European beaches in my back-packing student days, I was surprised to find that most of the beach was occupied by lawn chairs and umbrellas. Coming from Florida, I was used to long stretches of sand and surf, as far as the eye could see. 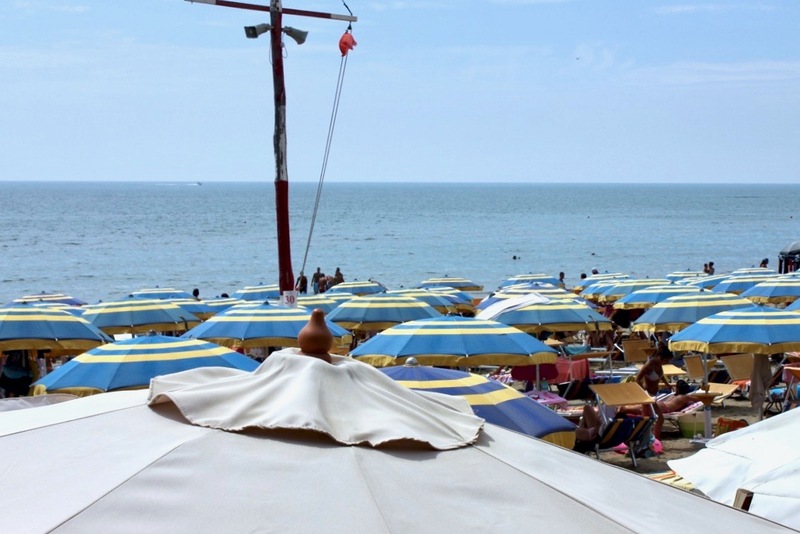 This scene of side-by-side beach umbrellas at Torvajanica (a little further south from Ostia) is pretty typical of beaches in Italy. For one thing, it means you don't have to haul a lot of stuff with you when you come to the beach. You can just pay for a big umbrella and comfy lounge chair. Also, when it comes to the more nicely-equipped of these stabilimenti, I think many Italians find it's worth paying to have a calmer, quieter, less chaotic beach experience. And they like having the services of an on-site shower, maybe a pool, and a bar/restaurant. In fact, a lot of Italians pay for a year-round pass to their favorite establishment, making it a kind of exclusive club (anyone can join, it's only about money). So you'll need to decide if you want to pay (rates vary by beach, by establishment, and of course, by services you choose), or if you want to head for the free beach, knowing you'll need to bring your own mat/towel/chair etc. It will cost around 10€ and up for the all-day use of an umbrella and one chair. At some locations you can also rent a private changing cabin. And depending on the beach, and the establishment, you may wind up paying an "entry fee", which gives you access to the showers and pool. Just so you know, spots closest to the water are often reserved for the full-time members of a given establishment. Where are the best Rome Beaches? 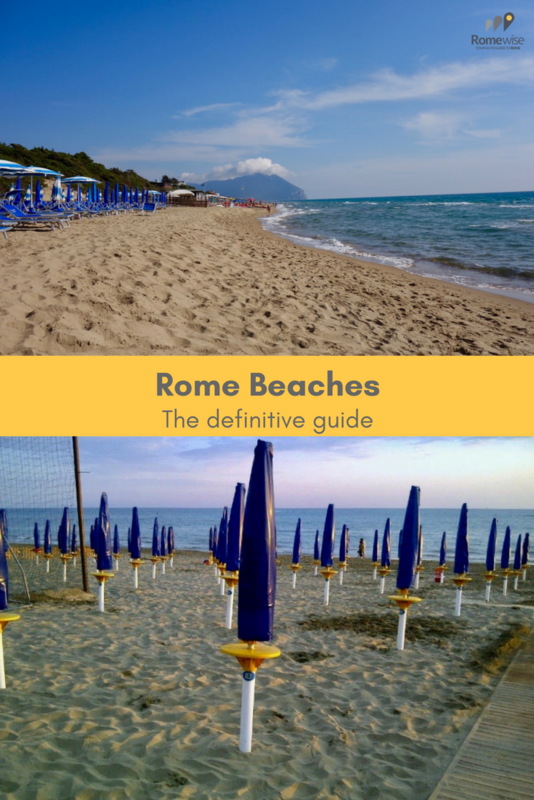 Following are my favorite Rome beaches in order of easiest to reach, and how to reach them. 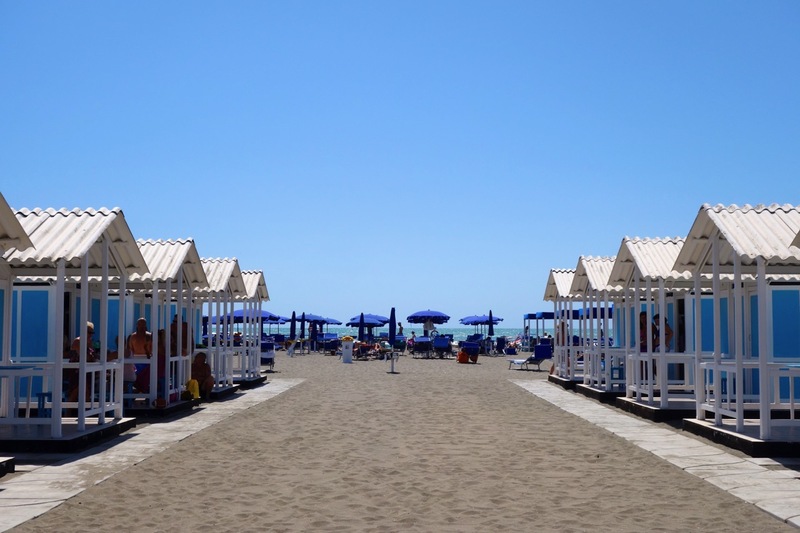 The closest beach to Rome, and the easiest to get to, is Ostia. Most Romans will tell you this is not the nicest of the Rome beaches, but it is where many of them go just the same, simply because it's so close. 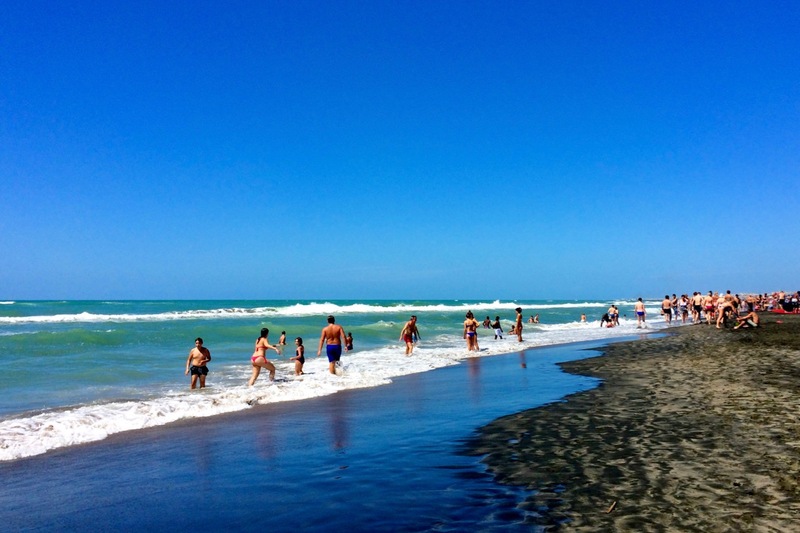 Ostia is the closest and easiest to reach of Rome beaches. If you flew into Rome, you may have landed at Fiumicino airport, which is just a little north of this beach. So you can see how close we are to it. Ostia has a lot of stabilimenti, where you'll pay for entry, chairs, umbrellas etc. But you can also look for the free beaches in between, or go further south to the free-entry cancelli (see below for how to get there). 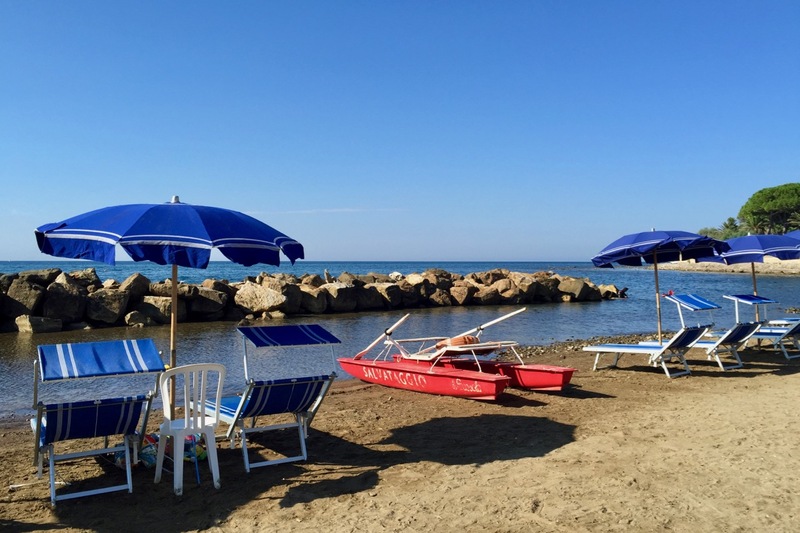 This private beach establishment at Ostia Beach, Gambrinus, offers an upscale, quiet, more refined beach experience, along with cabins, a pool, beach-volleyball, a restaurant, a cafe, and of course, umbrellas and lounge chairs. Ostia is actually part of the municipality of Rome, so the same ATAC bus/train tickets are valid here. You can use the same ticket you used to arrive in Ostia to get on one of the buses that goes up and down the beach road, as long as the time has not expired (100 minutes from the time you first validated it). Make sure you have extra tickets on you, as it may be hard to find a place to buy them once you are there. How to get there: Take the Rome Metro Blue Line B to Piramide, then, using the same ticket that you used for the Metro, take the Ostia-Lido train (about half hour). There is only one direction from the Piramide station, which is out towards the sea (Ostia). Get off at Ostia Lido Centro (not to be confused with Ostia Antica, unless you want to spend a couple of hours visiting these incredible ruins - which I do recommend either for another day, or, as a half-day visit if you only want a half day at the beach). Instead of getting off at Ostia Lido Centro, stay on the train until the very last stop, Cristoforo Colombo. At this stop, you can see quite a lot of (fee-based) beach clubs. Or you can grab one of the 06, 07, 061 or 062 buses (they run about every 15 minutes), and go to the cancelli, which means gates. At the various cancelli, you'll have access to plenty of free beach space, dotted with places to eat, and public bathrooms. I have a soft spot for Santa Marinella beach. I find it charming, romantic, and just so cute. The beaches here are pretty small, and in many parts, you have to wade through some reeds before you get out into more ocean-y water. The beach at Santa Marinella is small and cozy and I love it. But I love the atmosphere and sweet prettiness of the whole place. Above is a video of a day trip I took to Santa Marinella in winter. It's fun and beautiful year-round! View from the Santa Marinella beach-front restaurant while we lunch. How to get there: Hop on the local train from any of Rome's train stations, including Termini, Ostiense, Trastevere or San Pietro), and go to S. Marinella (the "S"of Santa is abbreviated). The trip costs around 10€ and takes just over an hour. Follow the other bathing-suit clad people getting off the train and you will arrive at the beach in about 5-10 minutes' walk. 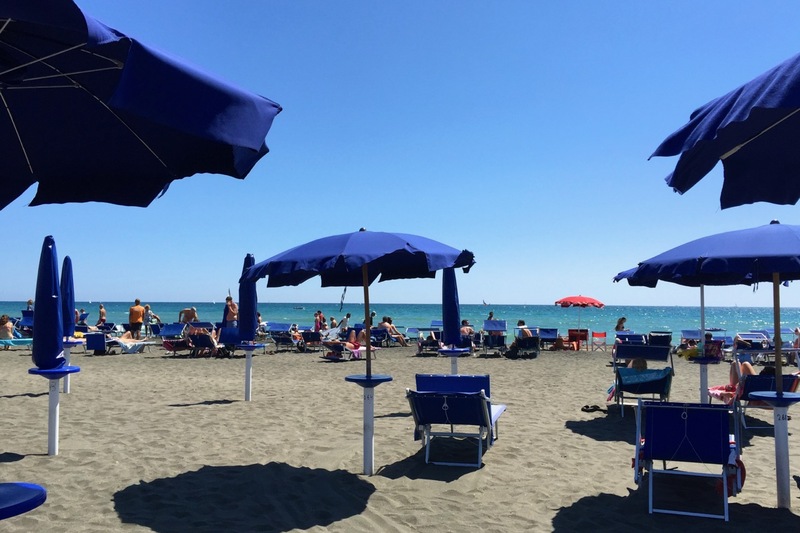 Fregene is slightly further north than Ostia, so it's still one of the Rome beaches that's close and relatively easy to reach. This is where the young crowds go, in particular to spend the evening. It can get pretty chaotic on a weekend summer night, but during the day, it's lovely. 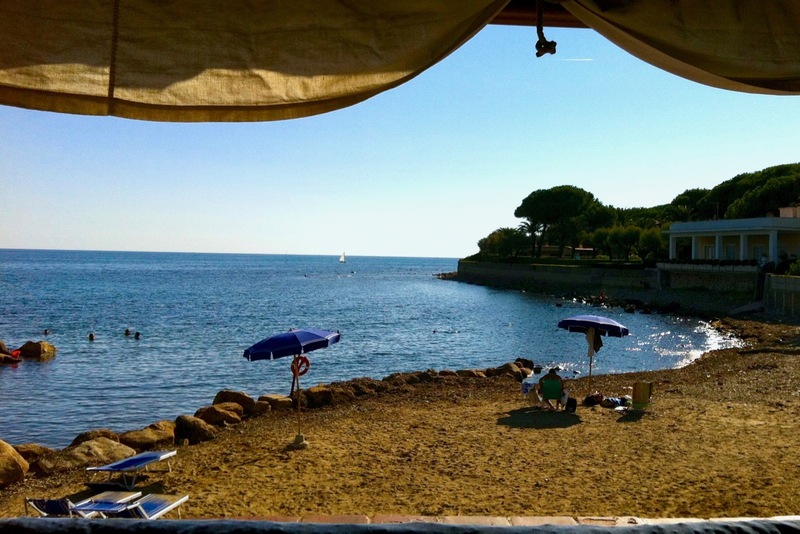 Our favorite spot at Fregene beach is La Scialuppa. It has a lovely beach, although very few services other than the chairs, umbrellas, bar and restaurant. We love staying until sunset and enjoying a yummy seafood dinner at La Scialuppa. Waiting until sunset at Fregene means getting to enjoy this beautiful light, and a delicious seafood dinner too. How to get there: Take the "Pisa - Livorno - Grosseto" train from Rome Termini to Maccarese (around half an hour, 2-6€). From the Maccarese station you can wait for the hourly bus to pass, and take it 10 minutes to Fregene, or you can grab a taxi, which will cost around 10€. Santa Severa is the beach just before Santa Marinella. There is a medieval castle right there, making for a pretty dramatic backdrop. This beach is another favorite for Romans, because it's easy to get to, and also because the beach is mostly spiaggia libera (free). How to get there: Take a regional train from any of Rome's main train stations, to Santa Severa. The trip lasts about an hour, and costs 4€ one way. Trains run about every hour. These are my favorite Rome beaches. There is something about the wild and free nature of Sabaudia that just grabs me. 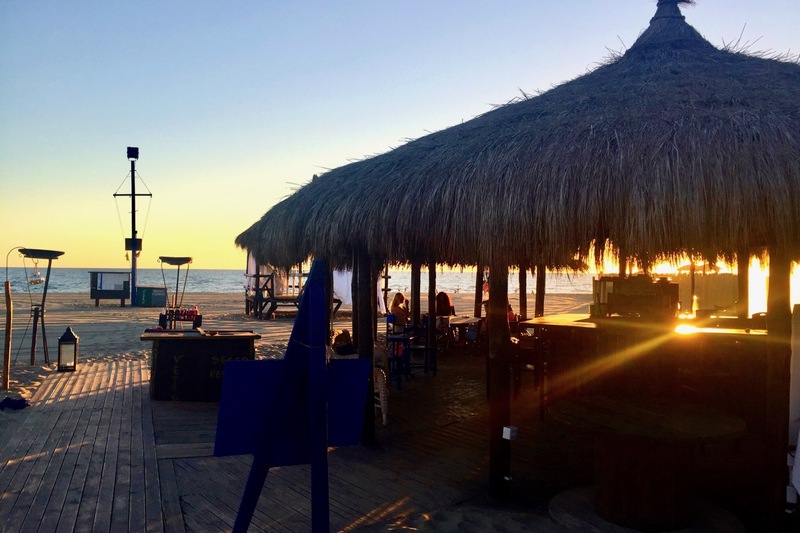 At Sabaudia, you have just a very long strip of sand and beach, and few stabilimenti (fee-based beach clubs). In this photo, you can see some chairs and umbrellas belonging to one of very few beach clubs at Sabaudia. Most of Sabaudia is a free beach, and very un-equipped. This also means there are a lot fewer services and places to eat than you will find at the other Rome beaches. Also, the other side of the road is just marshland. There are no buildings, no discos, no dj-hosted beach parties. This is precisely why I love it. 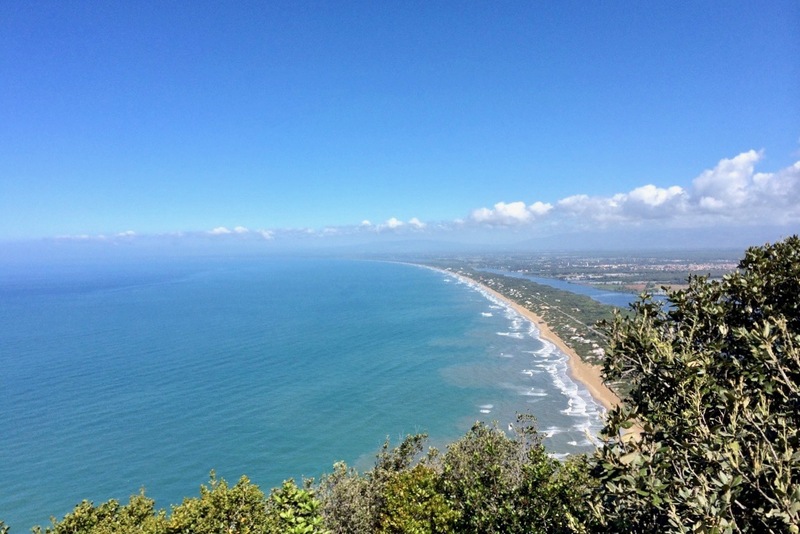 From Monte Circeo (a great place to hike in spring or fall by the way), you can see the lovely strip of clean, uncluttered Sabaudia beach. And the water here is amazing. A friend of mine visiting from Brazil actually said to me that the water reminded her of beaches in Brazil. That is saying a lot. The beach at Sabaudia almost always wins an annual "Bandiere blu", or Blue Flag award for its cleanliness and beauty. How to get there: Take the regional train from Rome Termini towards Naples. The trip costs 5-13€, and takes about an hour. These trains leave around once an hour. Make sure one of the stops will be Priverno Fossanova. This is where you will get off. From there, catch a Cotral bus to Sabaudia town. These buses go about once an hour or so, and take about half an hour. From the town of Sabaudia, you can walk to the beach about 15-20 minutes, or catch another local bus. 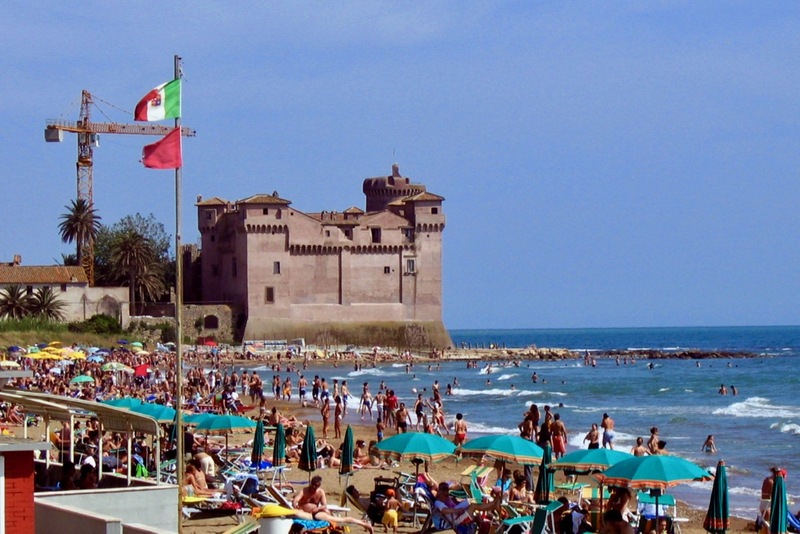 Anzio is about an hour from Rome's city center, and like Ostia, is very easily accessible by train for a mere 7€ round trip. Anzio beach and umbrellas. Photo by Joanne Bergamin of TravelAngel.me. That gorgeous beach photo above was taken by my friend Joanne Bergamin. Visit her blog to read her excellent, informative and funny description of a day trip to Anzio from Rome. Honestly, until Joanne started telling me about going to Anzio beach, I used to think of Anzio more as a port city or fishing village. 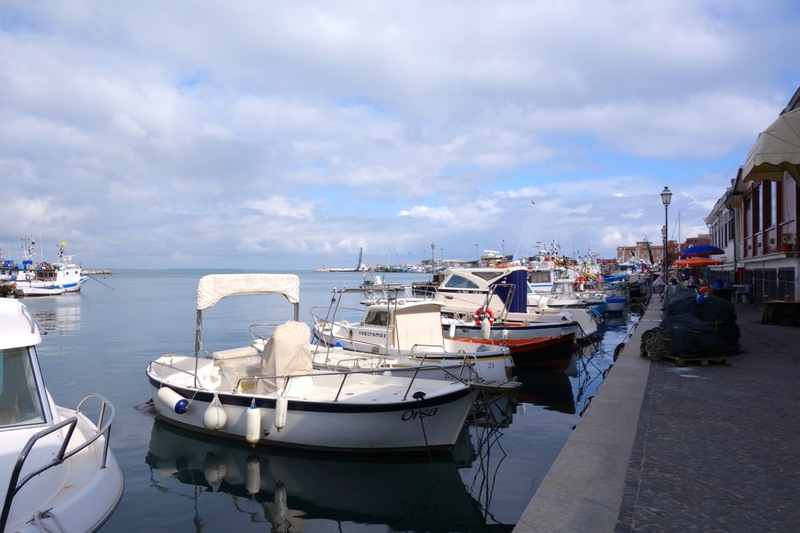 Anzio is a quaint little port village that offers a scenic place to stroll, plenty of restaurants and shops, and a chance to visit the historic place where the Allies landed in WWII. And of course it is well known as the site of the Allied Forces' landing in World War II. 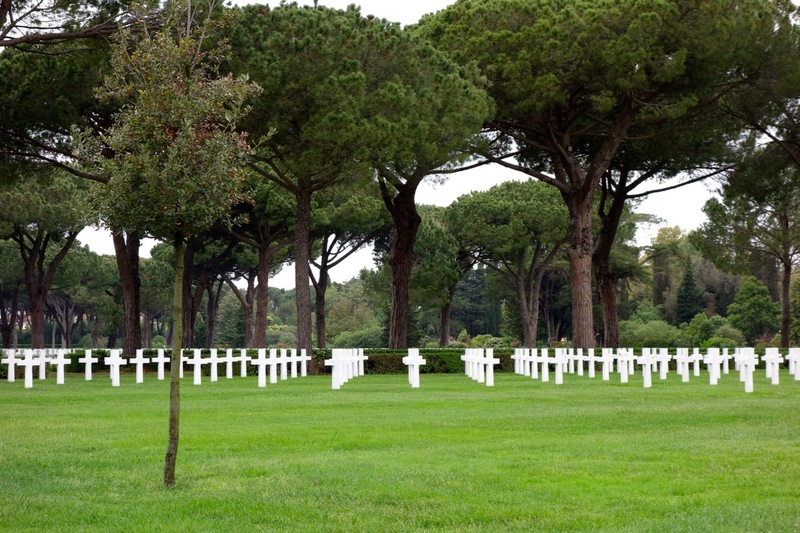 The American Cemetery is not far from Anzio, in neighboring Nettuno. It's very much worth a visit on its own. 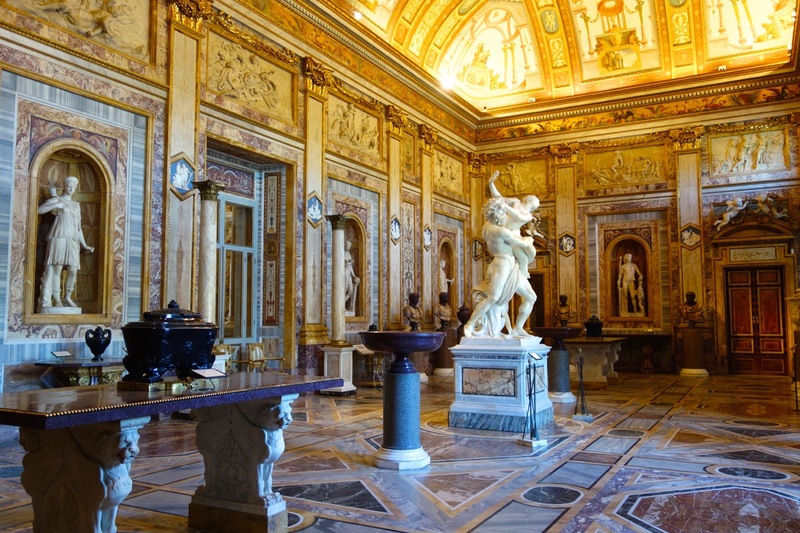 You can opt for an excellent full-day tour from Rome, that includes the cemetery and much more. The Sicily–Rome American Cemetery and Memorial honors the brave American men and women who gave their lives in WWII. 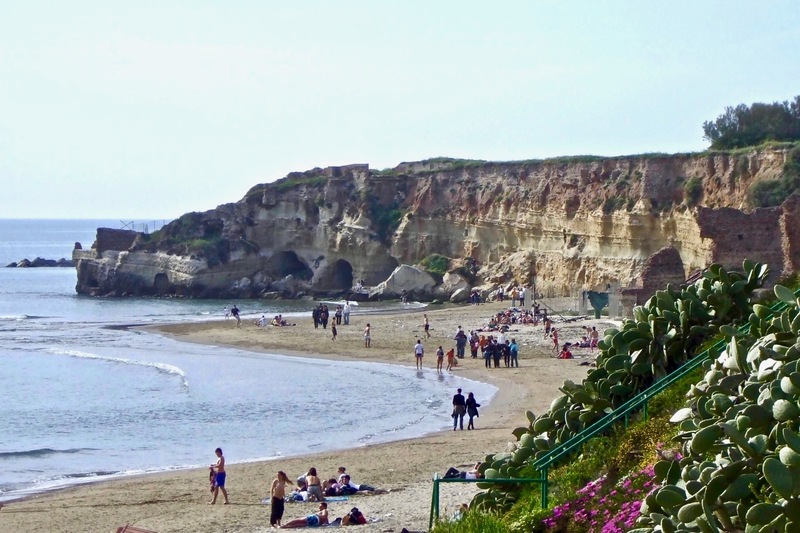 The beach in Anzio is divided into a small free area, and a bigger private area that charges admission. The beach itself is flanked by a rocky landscape dotted with Roman ruins from the time of the Emperor Nero (who was from here). How to get there: Take a regional train from Termini station to Anzio. Trips last about an hour, cost 4€, and run around once an hour. Many locals agree that Sperlonga is one of the prettiest of the Rome beaches, even if it's really time-consuming to get to. In fact, you might even want to stay for a couple of days. Sperlonga beach as seen from Gaeta. Photo by Casa Mia Food and Wine. One of the nicest things about Sperlonga is the pretty town the beach is in. It's worth visiting all by itself for the cute tiny streets, the striking views, and the amazing seafood. This is one of those Rome beaches you can visit in winter, and just enjoy the town and the food. Option 1 - Take a regional train from Rome Termini (and other stations), to Formia. The train takes about an hour and costs about 20 Euros one way. At Formia, get the local bus (1-3€) to Sperlonga. These buses come about once an hour, and take half an hour to get to the town. 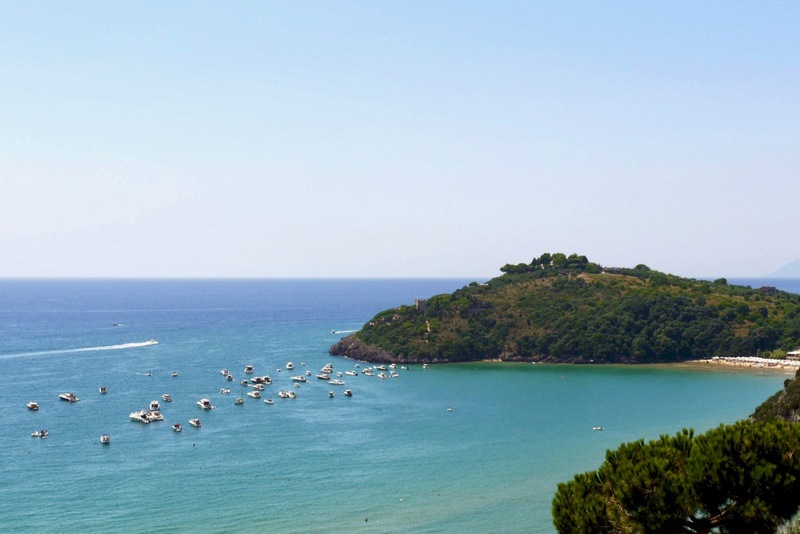 Option 2 - Catch a train from Roma Termini to Fondi-Sperlonga. Then take a local bus to Sperlonga. These buses come sort of sporadically, so you should check timetables in advance (site in Italian only), or perhaps spring for a taxi from the Fondi station (around 20-25€). 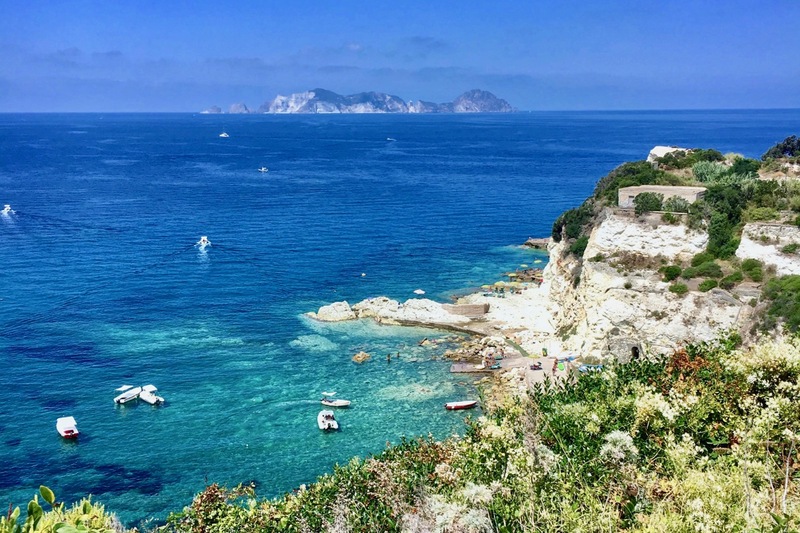 Ponza is probably the farthest of the Rome beaches, but absolutely worth the effort it takes to get there. 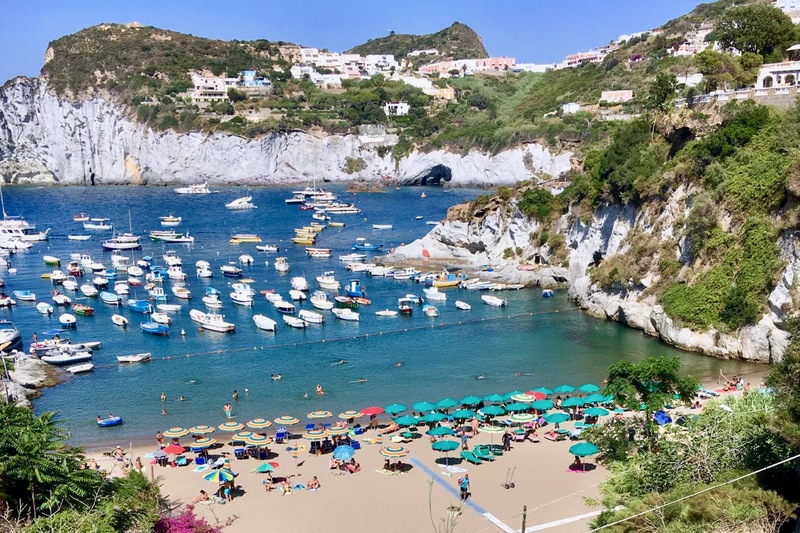 Ponza is an island not far off the coast near Rome, and while you can visit it as a day trip, you may want to consider spending a day or two there. Cala dell'Acqua on Ponza. Photo by Gillian Longworth McGuire of Gillian's Lists. Since my pal Gillian goes there often, she has a lot of writeups on her blog, from how to get there, to the best beaches, to things to do and more. Go check it out! Cala Feola on Ponza. Photo by Gillian Longworth McGuire of Gillian's Lists. 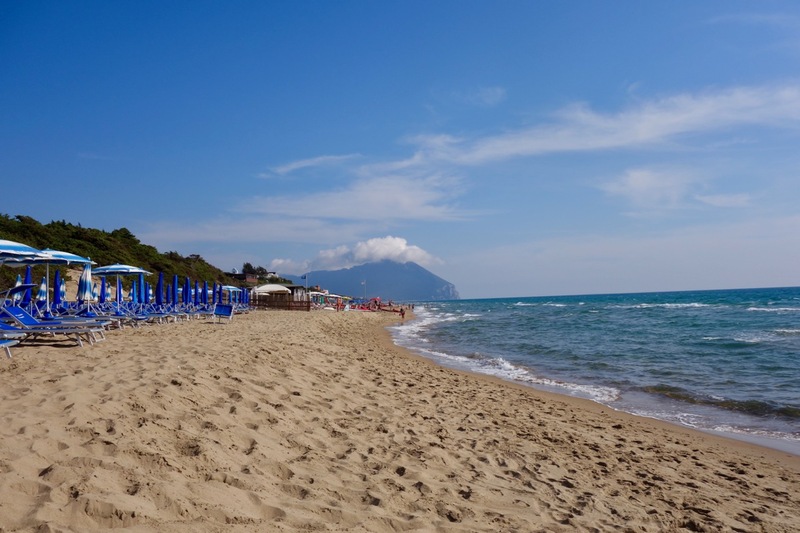 How to get there: You'll need to take a train to one of the towns south of Rome (Terracina, Anzio, Formia), get to the port, and then take a hydrofoil or ferry to Ponza. See Gillian's page for more details. You can also book a day-long tour, so you can leave the planning to others, and just enjoy the journey. Maybe when you were thinking about Rome beaches, the idea of a lake did not immediately come to mind. Southeast of Rome lies lake Albano, a quiet, sweet lake with lovely places to eat, and an easy, flat walking path that loops around the whole thing (maybe a 2-hour walk max). Castel Gandolfo at Lake Albano offers a quiet, quaint alternative to a seaside beach, and is very easy to reach from Rome. Castel Gandolfo, the summer home and gardens of the Pope, is at Lake Albano. You might consider a full-day r/t tour from Rome that includes lunch, or even a full-day electric-bike trip to the lake. If you go on your own, you might want to opt for a romantic, and delicious, lunch or dinner at the famed Ristorante Pagnanelli, where you can enjoy amazing lake-views and first-rate cuisine. 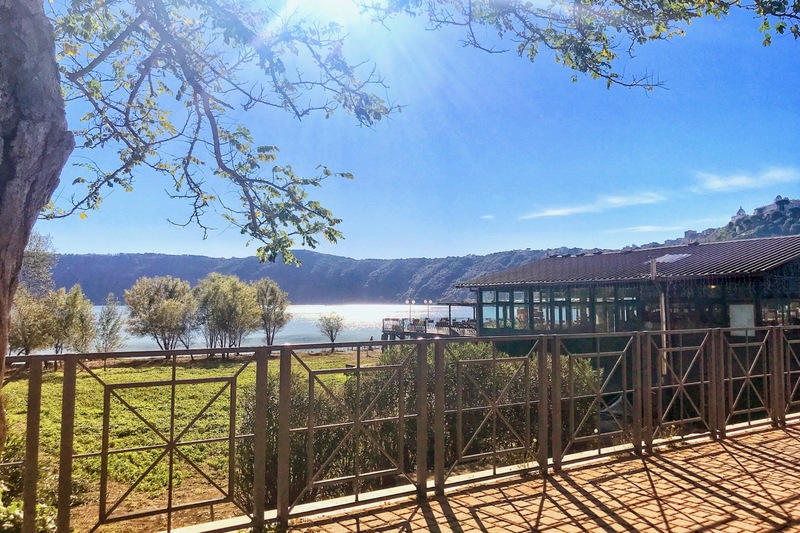 For a step by step description of how you can spend a day visiting Castel Gandolfo, check out this blog post by Natalie of An American in Rome. How to get there: Trains leave Rome Termini (and other stations) at least once an hour, and take about 45 minutes. The cost is about 2-4 Euros one way. Once you arrive, you will be almost right on the shore. 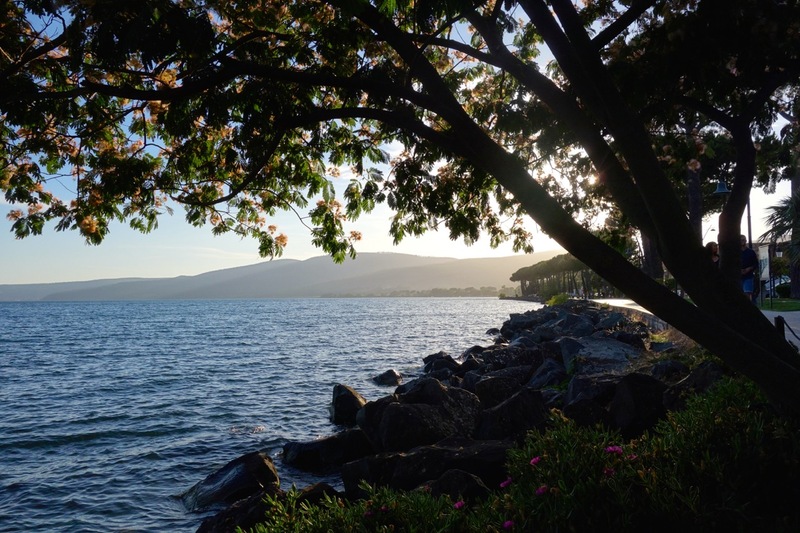 North of Rome by about an hour, Lake Bracciano offers several options for a lovely day trip out of Rome. You can go just to do something different, get out of the city, do some sight-seeing, have a nice lunch by the water, or, enjoy the lake-front beach there. The lake has a few towns around it, including Anguillara, Bracciano and Trevignano. If you have a car, visiting any of these is easy, and you can find parking as well. Lake Bracciano is enormous and has several picturesque towns to visit and places to eat all around the lake. Bracciano also boasts a 15th century castle you can visit (most famous for where Tom Cruise and Katie Holmes were married). How to get there: Take the local train from Rome's San Pietro station (right behind the Vatican), all the way to Bracciano. It costs under 8€ one way. Trains leave about once per hour, and it takes about an hour to get to Bracciano. From the station, you can walk down to the shore. You can also consider a half-day tour, which of course takes all the planning off your hands. Photos on this page are mine except where noted. 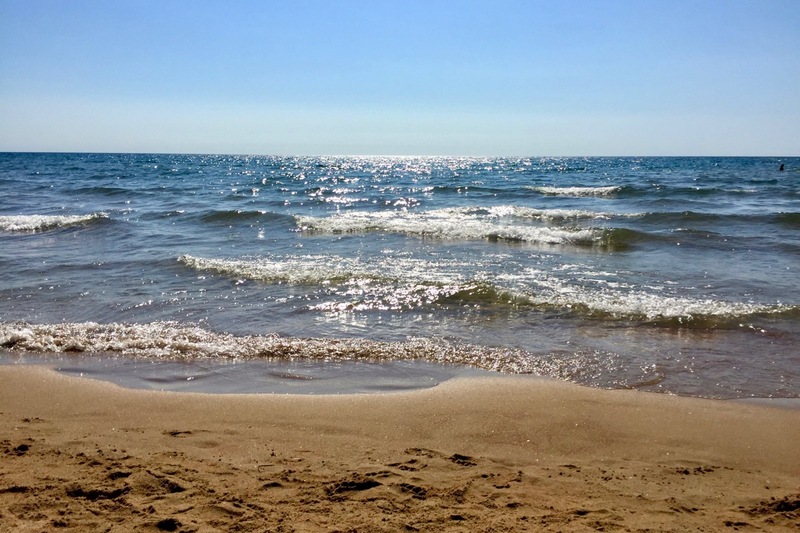 Special thanks to my friends Gillian Longworth McGuire (Gillians Lists), Joanne Bergamin (Travel Angel), Gina Tringali (Casa Mia) for generously sharing their Rome beaches photos and stories with us. Return to the top of Rome Beaches.